Our luxury holiday cottages are exclusive to Choice Cottages, so you book the best at the very best price. North Devon is one of the most popular holiday destinations in the UK and is blessed with some of the best coastline in the world, while offering fantastic scenery. We believe that it is worth that little extra to book a luxury holiday cottage that matches the area you have chosen. It is amazing the difference those little extras make when choosing the yearly family holiday or special short break. 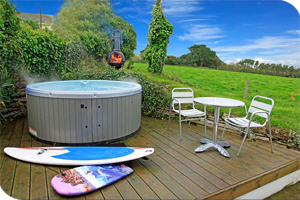 Our luxury cottages are carefully chosen for their location, high level of specification, fixtures and fittings or additional extras; which could include indoor heated pools, hot tubs, wifi, log fires, multiple living and entertainments areas, large grounds, dog friendly - the list goes on, so take a browse through our carefully chosen selection today. To view all our luxury holiday cottages please see below, alternatively if you would prefer to search by date and criteria please use the search on the left hand side. Your search returned 41 properties.